Lumen Tights, former online shop, sent Hosiery For Men, the blog that exclusively reviews hosiery for Mantyhose.net, samples of the men’s tights made by Tim Legwear, a hosiery manufacturer based in Bulgaria. The TIM Legwear Action 90 denier men’s tights are made from 85% Polyamide and 15% Elastane. They are packaged in the same way as the Force 40 denier tights. The tights are folded around a card rectangle then house in a full colour card sleeve. This is then covered by a clear plastic envelope. 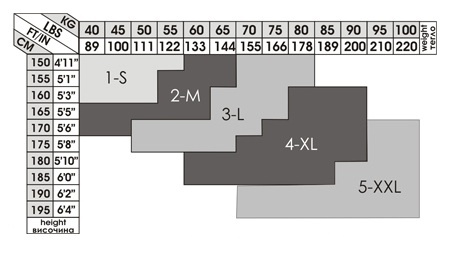 The packaging provides an impressive level of information on the fabric, features and sizing. As with the Force 40 denier tights, the Action 90s look long in the leg once removed from the packaging. The fabric is soft but also quite durable in feel. When worn the tights have good, but not total, opacity and the coverage is even throughout. Appearance is mainly matt, with just a hint of shine. The reinforced brief is constructed with denser material. There is a male comfort panel at both the front and rear of the brief. The seams that run around this are flat and well-engineered. As with the Force 40s, the waistband has been designed for comfort is 5cm wide. This is 1cm wider than the Force 40 denier tights. The TIM Legwear Action 90 denier men’s tights are available from in three sizes: 3 (L), 4 (XL) and 5 (XXL). The Action 90s fitted really well especially in the legs. There was no constriction at all and I didn’t need to over-stretch them when putting them on. They were a really comfortable wear and also nice and warm under jeans. Like the Force 40s, the male front panel provided good support. The brief was a little too shallow for me; some more depth there would definitely have been a further positive. However, the brief does have plenty of room which is an advantage if you are carrying a few more pounds in the lower belly area. The TIM Legwear Action 90 denier men’s tights are available from Lumen Tights in just one shade: Black. The TIM Legwear Action 90 denier men’s tights cost £11.99 at Lumen Tights. 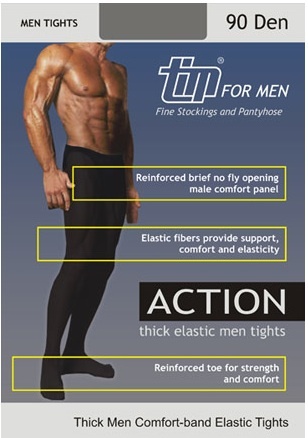 The TIM Legwear Action 90s are good quality men’s opaque tights. They are soft and feel extremely comfortable against the skin. The fabric is pretty robust and I feel these would stand up well to a lot of wear. A further positive is the flexibility and elasticity of the fabric, meaning they would be a good choice if bought for sports and outdoor activities, such as hiking, skiing and cycling. This article was contributed by http://hosieryformen.blogspot.co.uk. This outstanding review was written by a men.